Conceived and curated by artist Benji Jeffrey Company Property took its name from the Renaissance term for the costumes and sets owned by touring theatre companies. An exciting and eclectic selection of young artists were drawn together in a sensual exploration of the implication of performance in the visual language and experience of the work. The curation of the works explore the potential of exhibition as theatre, and a show was created that blurred the line between exhibition, artwork and performance. 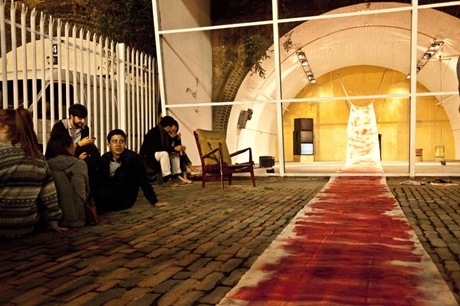 The works selected were potential acts, whether in the past, present or future, allowing each visitor a potentially unique engagement with the exhibition. The full duration of the exhibition was 52.15 minutes. In a further exploration of the ideas within the exhibition an evening of film and performance, Accompanying Property, co-curated with Paul Kindersley was held on 26th August.